Rich & sweet, this Grape & Beet Cold-Pressed Juice is filled with the late summer bounty of vegetables and the abundant harvest of grapes here in southern Oregon. Enjoy as an afternoon treat or serve with dinner as you would wine. Wash all fruits and vegetables thoroughly, preferably soaking briefly in a bowl filled with water and produce wash, then rinsing thoroughly and drying on a towel. Be careful with the beet as it will turn everything it touches red, including your hands! 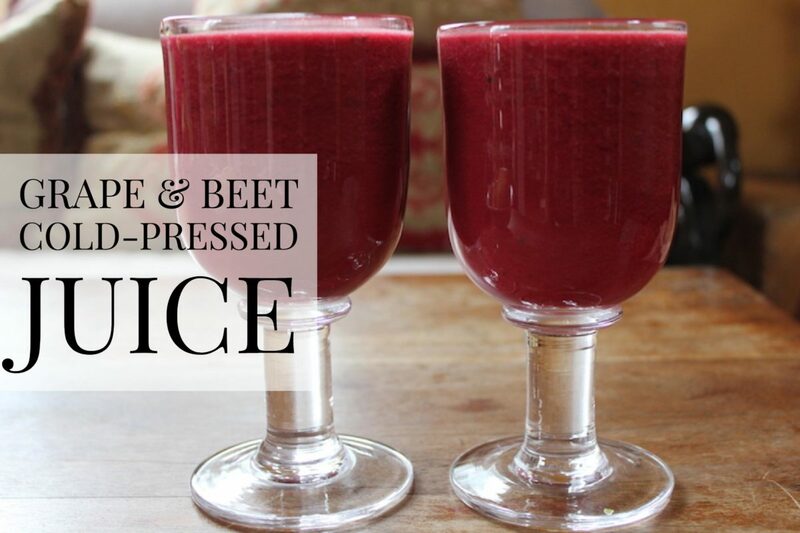 I developed this recipe using the HUROM Slow Juicer. Juicer settings vary from brand to brand. Set yours up according to manufacturer’s directions and your personal preferences. Using the HUROM Juicer, have the Juice Cap closed and the Pulp Control Lever in the open position, add one piece of prepared produce and then turn the motor on. Begin adding the cut up fruit and vegetables alternating between soft and firm and leafy. When the juicer is full, open the Juice Cap and let the juice pour into the pitcher. Close the Juice Cap back up and continue to juice and blend the remaining ingredients. Add those also to the pitcher. If you would like to remove even more pulp, strain the juice into a serving pitcher or glasses. Some of the newer cold-pressed juicers come with an optional strainer attachment. I enjoy the pulp and simply stir with a whisk to blend all of the juice and remove excess pulp.